During their college careers, the current sophomores and juniors in Utah’s football program will make two visits to Husky Stadium, the iconic venue in Seattle with 70,000 seats and a view of Lake Washington. In between, they will play in 23,595-seat Huskie Stadium, the smallest facility to host a Ute football game in 40 years. Utah’s trip to Northern Illinois for Saturday night’s game, televised by ESPNews, is not the weirdest matchup in college football this month. Arkansas' visit to Colorado State and Miami’s game at Toledo top Utah-NIU for that distinction, among a dozen cases of Group of Five schools hosting Power Five programs. Most of those pairings either have regional flavor or recruiting-based motivation, such as Indiana at Florida International. The Utes don’t recruit football players in the Midwest, where the late Rick Majerus scheduled the likes of lowly Chicago State to reward his Ute basketball players from the area. So how did this happen? The explanation has something to do with Utah State, where Utah played in a 20,000-seat venue in 1978, just prior to the expansion of then-Romney Stadium. The answer also involves $1 million or more, the cost of buying a home game in today’s market as opposed to booking a home-and-home series. 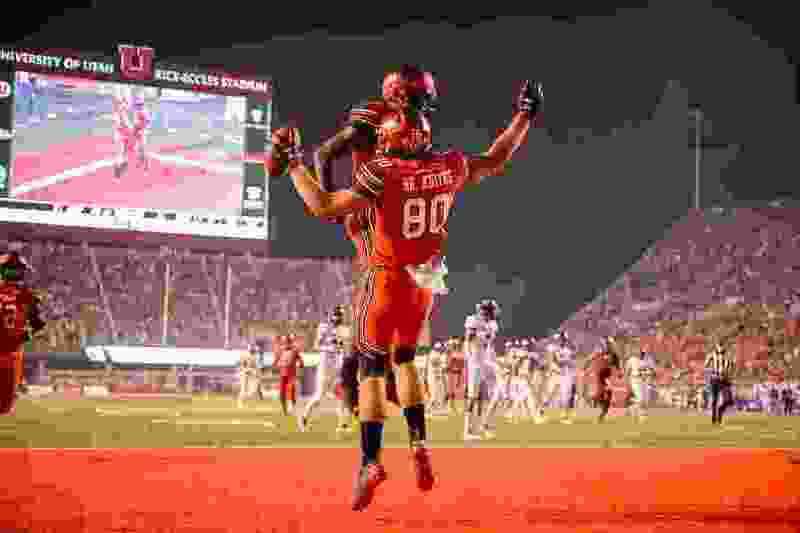 The Utes have played series with Fresno State and San Jose State in this decade and have two-game sets against Wyoming, San Diego State and Houston in 2020 and beyond. The timing of the Utah-NIU contract makes Whittingham’s story plausible, even if it seems illogical for him to have no role in scheduling. As of July 2014, coming off two 5-7 seasons and having his staff’s performance scrutinized by former athletic director Chris Hill, Whittingham likely was less concerned about whom the Utes would play in 2018 and ’19. Georgia Tech at South Florida. Hill, who retired in May after 31 years on the job, regularly defended his decision to move away from scheduling USU. In 2015, he cited the in-state series with BYU as sufficient. “There’s no other team in the country that has two very competitive FBS rivals that it is expected to play every year,” Hill said. That comment came relatively soon after the Utes lost in Logan in 2012 (the program’s only nonconference defeat in the Pac-12 era) and were nearly upset at home the next year. In his A-B-C outline for nonconference scheduling, Hill came to view the Aggies as an “A” opponent, he said. As a“B” opponent, NIU has good Group of Five credentials. The Huskies have played in a New Year’s Six game more recently than Utah, for instance. Hill’s booking of NIU came the same summer when the Huskies agreed to a two-game series with BYU, meaning they’ll play in Provo in October and in Salt Lake City next September (the return game vs. BYU is in 2020). So the Utes will play 60 miles west of Chicago in DeKalb. Remodeling has reduced Huskie Stadium’s capacity to 23,595. Even so, Utah-NIU is less of an outlier than it may seem. Power Five member Boston College visited NIU last season and other Mid-American Conference schools this year will host Maryland, Kansas and Miami. South Florida, a Group of Five school where Ute athletic director Mark Harlan formerly worked, started a home-and-home series with NIU in 2016. Such contracts are becoming more popular, now that the cost of buying home games is so high. NIU received $1 million for Saturday’s opener at Iowa, a 33-7 loss. The Huskies will get $1.6 million for playing at Florida State later this month. USU earned $1.4 million Friday for its 38-31 loss at Michigan State. This week’s trip marks the Utes' only nonconference road game of 2018, when they play four Pac-12 games at home and five on the road. Utah is among eight (of 65) Power Five schools with six true road games this season, according to The Associated Press. The Utes played seven home games in 2013, ’15 and ’17 and will do so again next year, when NIU comes to town.